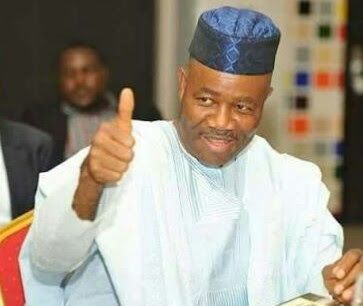 The leadership of All Progressives Congress (APC) in Akwa Ibom State have unanimously endorsed the candidacy of Senator Godswill Akpabio for the Akwa Ibom North West Senatorial District. According to a statement by his Media Aide, Anietie Ekong, Akpabio was adopted for the 2019 elections after a long meeting of the party elders at Obong Ntak, the country home of Chief Inibehe Okorie, a senatorial aspirant. After the meeting, Okorie told his supporters that he decided to forgo his aspiration in the interest of the party and the Senatorial District. He extolled Senator Akpabio as an “Uncommon Senator” and said he was excited at his entry into the APC and enjoined his supporters to work for his election. In his response, Senator Akpabio said the unanimous adoption is a confirmation that he will add value to the APC in the country. “Those in attendance at the meeting included, former Petroleum Minister and Chairman of the State caucus of the party, Atuekong Don Etiebet, APC State Chairman, Mr Ini Okopido, Senator Godswill Akpabio, Managing Director of the Niger Delta Development Commission (NDDC) Obong Nsima, Deputy Inspector General of Police, Mr Udom Ekpoudom (rtd) among others."